He winked, I blinked. He stripped: bare as butter with a beard. he paused, “You’ll have to put down the bees,” he breathed. – and so wildly did we do the deed, that from us each rose galaxies. crepuscular dusk and star shattered night. on this day of alchemical light. Who will bathe with her? the fruit of our earth’s quest. I WANT THE WORLD TO KNOW! This is my first ever poem, it was written when I was seven years old, in felt tip pen, on one page of an adventure gamebook called ‘Grail Quest: The Castle of Darkness’. This was the first book I ever bought for myself, it’s the kind of book where you role dice and fight monsters. My justification for posting it here? Well, the books (they are a series) are set in a rather idiosyncratic version of Camelot and have more ‘Grail questing’ in them than I realised at the time; for example, although even back then I recognised Merlin, who is the reader’s guide to the magic world of the books, one of the recurring characters is Pellinore… In this particular book he’s encountered on the way in and out of the Castle in question. You carry a sword called Excalibur Junior, and your character lives just a couple of miles outside of Glastonbury. More about them here. The recurring character who’s important here, though, is the Poetic Fiend. The Poetic Fiend is a friendly vampire who writes doggerel, and encourages ‘Pip’ (that’s the name you take as the quester) to write himself. A blank page headed “Pip’s Poem for the Fiend” gives the space to do it. Anyway – with apologies for my faltering junior school spelling – here’s what I, as Pip, wrote for the Fiend; my first ever poem, written in a magical reworking of Camelot, under the watchful eye of a friendly vampire. Those who’ve seen my performances at the Open Gorsedds will note I appear to have been obsessed with birds from the start. When I see a bird fly. For my efforts, the Fiend rewarded me with one gold coin, and told me to “spend it wisely, on some foolishness”. In response to Tim’s request, i am posting this in the correct place! My piece on this year’s theme, ”12 Giants: The Glastonbury Zodiac”. The first half is poetry, the second half (beginning ”The Babe in the Boat…”) is a song. I’m not the world’s worst! Am now become an Elder Bard! We are Bards of the Year of the Hallmark! To form in courses of meaningful shape? Or was it all planned? And what on earth can all these pictures mean? Albion’s giants this realm did command. In the form of a song. One for each giant and then we’ll be finished. A beautiful deer, with no sound. Burst through, red-eared, with one bound. As the Hooded One bends his bow. Of all we can be and know. Breathe to become, newly burst through the boundaries. Blazing brow be reborn, boldly blossom in the dawn! Feel the bliss, be as one. Discipline wins the marathon. She is bright as the moon, sweeps all bare with her broom. On the Polden’s western side. To landfall at Dundon Fort. Lilting over the lake, linger long in its wake. Listen, learn, it’s your turn to leave more than you take. Needs knowledge of natures nine. And the infinite stormy brine. And arms, once denied, are sought. Will feel the knife and sword. Tree trunk align with the spine of the universe. Roots drink deep from the earth, like starlight your leaves shine! Are the keys to the Tree of Life’s great mystery. For the raven whose fate is foresworn. As the fawn and calf are born. Whose force-field would fail if disclosed. With one stone was Balor deposed. Float, flutter, fly, face the fear of the day you die. Pierce the veil, break the gaol, to the victor the tale! follow fools, you will fall; trust your heart, you will rule them all. In a tumble-down past Teifi’s Bend. But he overcomes her in the end. And how to strike straight to the heart. The soothing of sorrows, the suffering’s done. Sleep, sweet soul, soft the soil nourished for swelling. Soon the seed that was sown will be grown in the spring-time sun! With a raven’s wakeful eyes. For without it you’d better not start. High on a hill is the home of my family. With hedgerows hemmed in, I am haunted by dreams. I hear the harp playing heavenly harmonies. You shall have honey to feed the haughty May Queen. Will point us to the Grail. And double death did he deal. The sacred barge set sail. His damage for to heal. Do you dare to dive in to the darkness so dizzying? Deal with despair and the demons you bear? Make truth your devotion and open the door to your dreams! The other the timbre of moon. Attacked the next terrified town. And tangled in thorns, turned around. temper the steel with the teachings we learn. For the truth sometimes twists, but mostly it tends to turn. And poetry’s nine senses made. By the coppice on the shore. And Cormoran is no more. Concepts and knowledge in wisdom’s control. But the chalice will serve those who serve the creator of all. The gate-keepers of the mound. And the magic of Merlin’s gown. Many mouths may you feed with your manna and mead. Man and woman embrace the impermanence of mortality. Is brought down by Greid’s grey dog. Then shave off his head to be sure! Gird your loins, take the stage, play the game, gracefully engage. Though the struggle be grim, truth and goodness must win. For only the guileless are within grasp of the Grail. And the light of the mid-winter’s dawn. For a reckoning of the score. Heralds the end of our tour. Is to wait for the hunter to rise again over the ridge. Oh Albion! What have we done? To our daughters and noble sons? This year’s theme was “Twelve Giants: The Glastonbury Zodiac”. 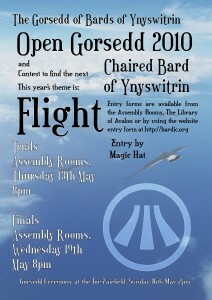 Carly Roberts was chosen to be the sixth Bard of Ynyswitrin on St Dunstan’s day 2011. Tim Hall won the Crown and Oshia Drury was awarded the Tim Sebastion Memorial Trophy in recognition of her musical service to the community. Molly was installed as this year’s Younger Bard. This means Tony Atkinson now joins the ranks of the Elder Bards. 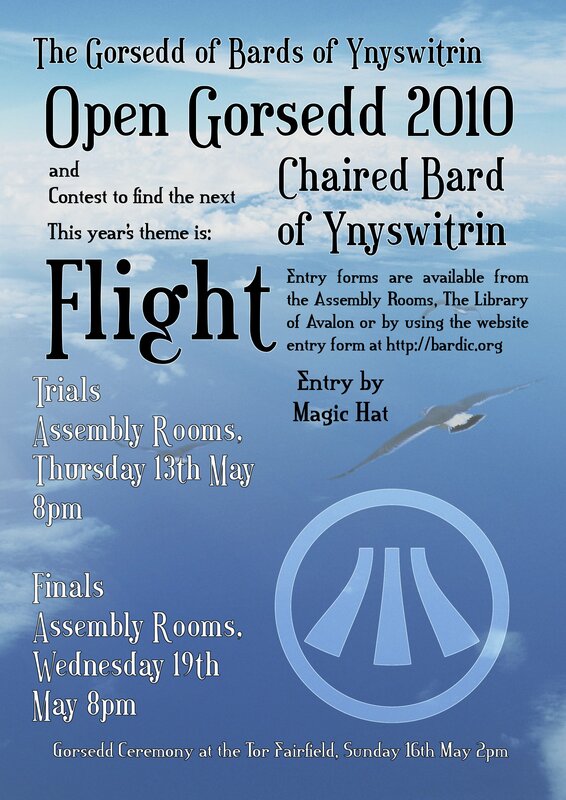 This year we admitted eight new Bards into the Order at the Annual Open Gorsedh ceremony. Kat Brown :: TSMT 2010. Carly Roberts :: Bardic Chair 2011. Thanks to everyone who came and made this such a strong and inspiring event! again, just posting this in the correct place now…my winning piece from last year – (back when i was GlastoBard MMX) !!! Yet, in turn, is ETERNALLY LOUD! Not the con science of conscience but the Up Wards of upwards. The Silver Tongue and the Blarney Stone. Means first to sight from below. But i’ll fly at prescription and outrageous discrimination. I’ve felt her tiniest footfall brush, flicked, windswept, such flyaway hair! I’ve known our love to elevate such that it emanates around and between. Soar and swoop, detect, select, glide, quite alike. Perched, we were, on Gog and Magog in turn. There be Dragons and ‘Ell ’Ounds o’er Glaznbry Tor! A Somerian becoming a Phoenician! Till what’s onerous is feathered to (no more than) alas. And came to rest at Chalice Well. Was right beside me all the while! Flight is merely a Launch without a Path. Is Knitted together like the Barbules of a Feather. Rushing across Airways and riding Airwaves. But to See and Be Above? Since Ynys Witrin and the Fair Avalon of Albion”. So what (ON Earth) have present Bards to Learn? Workers and Drones Swarm to the Queen till MORE…becomes less. Flew Higher than the weary one. Of what the Mayans described and Prophecised? Trapeze Artists, Wirewalkers and Glider Pilots. Phil Stretch :: Crown 2010. Harmony Davies :: Crown 2012 and 2013. Alison Hall :: Regular Judge. Amber le Faye Moon :: Lady of Avalon 2010. Declan Millar became our first Younger Bard; Kat Brown was awarded the Tim Sebastion Memorial Trophy; Phil Stretch got the Crown and Tony Atkinson was chosen to become the fifth Bard of Ynys Witrin.